We wanted to pass this message along from Audrey at the Guinea Pig Daily Digest to all cavies and their slaves. Some of you may be familiar with Peter Gurney, perhaps the most well known Rodentologist from the Cambridge Cavy Trust (founded by Vedra Stanley-Spatcher). This memorial is held every year in remembrance of Peter Gurney and all of our piggy friends whom have since left for the Rainbow Bridge. The email message below explains everything in more detail. We will be lighting our candles again this year. "You are invited to participate in our annual "Memorial Candle Lighting for Peter Gurney" on March 9th, 2012, at 8:00 pm, in your particular time zone. This is our 7th Memorial Candle Lighting, and all you have to do is light a candle on March 9th, at or around 8:00 pm, in honor of Peter Gurney and all of our friends, human and animal, who are with him at the Rainbow Bridge. For those not familiar with Peter Gurney, or this annual event, Peter Gurney was an author and guinea pig advocate who died in England in 2006 from cancer. He wrote many of the books on guinea pigs that we all use and his website is still a vital piece of information to all guinea pig lovers. 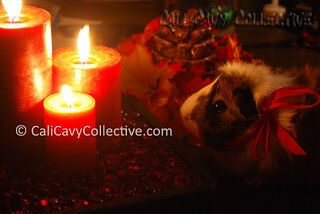 In 2006, the readers of the Guinea Pig Daily Digest (GPDD) held the first candle-light memorial in honor of Peter Gurney and all of our beloved guinea pigs and pets who have passed away. In subsequent years, we have also honored members of the GPDD community who have also passed away. This has become an annual event, and all you have to do is light a candle on March 9th (Peter Gurney's Birthday). After March 9th, just send an email to me, giving me your location (town or city, state, and country) and I will list all the places where a candle was lit, and post it on a map with a list of locations on the GPDD website. Last year we had over 80 participants from all over the world. If you would like to see a map and the list from 2011, just look at the GPDD Homepage www.GPDD.org Be sure to click on each box to see the individual locations. As candles are lit in each state or country, the light from each candle will move through each time zone, in memory of all the people and pets we are remembering. So Light a Candle on March 9th at/or around 8:00 pm. We will be lighting ours, too! Feel free to forward this email to others who you think may want to also light a candle to remember a beloved pet. Audrey and her Guinea Pig Gordon"
I'll be lighting a candle and remembering my beloved Dido, Irene, Admiral Pinky and Captain Pig.